Veneris, 29 die Octobris, 1680. Dr. Tongue recomtuended to the King. Address for supporting the King. ORDERED, That Sir George Downing have Leave to bring in a Bill for wearing of the Woollen Manufacture of England. Ordered, That Doctor Tongue be humbly recommended by this House to his Majesty, for the first considerable Church Preferment, that shall happen to become void in this Kingdom: And that such Members of this House as are of his Majesty's Privy Council, do represent the same to his Majesty. 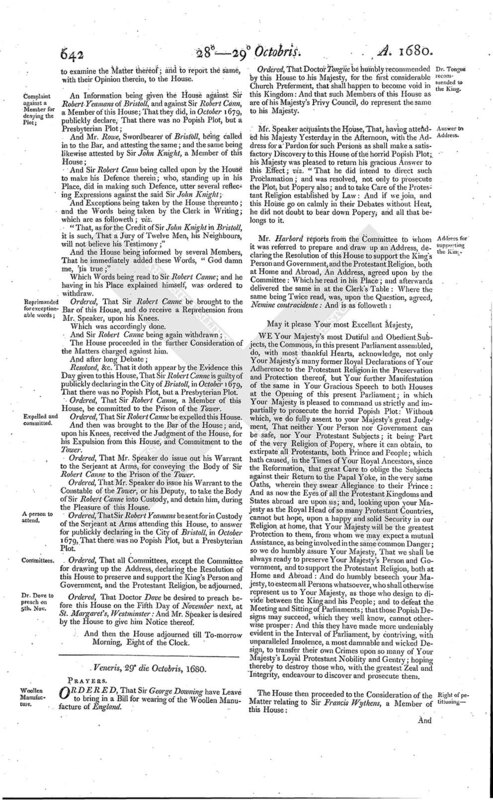 Mr. Speaker acquaints the House, That, having attended his Majesty Yesterday in the Afternoon, with the Address for a Pardon for such Persons as shall make a satisfactory Discovery to this House of the horrid Popish Plot; his Majesty was pleased to return his gracious Answer to this Effect; viz. "That he did intend to direct such Proclamation; and was resolved, not only to prosecute the Plot, but Popery also; and to take Care of the Protestant Religion established by Law: And if we join, and this House go on calmly in their Debates without Heat, he did not doubt to bear down Popery, and all that belongs to it. WE Your Majesty's most Dutiful and Obedient Subjects, the Commons, in this present Parliament assembled, do, with most thankful Hearts, acknowledge, not only Your Majesty's many former Royal Declarations of Your Adherence to the Protestant Religion in the Preservation and Protection thereof, but Your further Manifestation of the same in Your Gracious Speech to both Houses at the Opening of this present Parliament; in which Your Majesty is pleased to command us strictly and impartially to prosecute the horrid Popish Plot: Without which, we do fully assent to your Majesty's great Judgment, That neither Your Person nor Government can be safe, nor Your Protestant Subjects; it being Part of the very Religion of Popery, where it can obtain, to extirpate all Protestants, both Prince and People; which hath caused, in the Times of Your Royal Ancestors, since the Reformation, that great Care to oblige the Subjects against their Return to the Papal Yoke, in the very same Oaths, wherein they swear Allegiance to their Prince: And as now the Eyes of all the Protestant Kingdoms and States abroad are upon us; and, looking upon your Majesty as the Royal Head of so many Protestant Countries, cannot but hope, upon a happy and solid Security in our Religion at home, that Your Majesty will be the greatest Protection to them, from whom we may expect a mutual Assistance, as being involved in the same common Danger; so we do humbly assure Your Majesty, That we shall be always ready to preserve Your Majesty's Person and Government, and to support the Protestant Religion, both at Home and Abroad: And do humbly beseech your Majesty, to esteem all Persons whatsover, who shall otherwise represent us to Your Majesty, as those who design to divide between the King and his People; and to defeat the Meeting and Sitting of Parliaments; that those Popish Designs may succeed, which they well know, cannot otherwise prosper: And this they have made more undeniably evident in the Interval of Parliament, by contriving, with unparalleled Insolence, a most damnable and wicked Design, to transfer their own Crimes upon so many of Your Majesty's Loyal Protestant Nobility and Gentry; hoping thereby to destroy those who, with the greatest Zeal and Integrity, endeavour to discover and prosecute them. 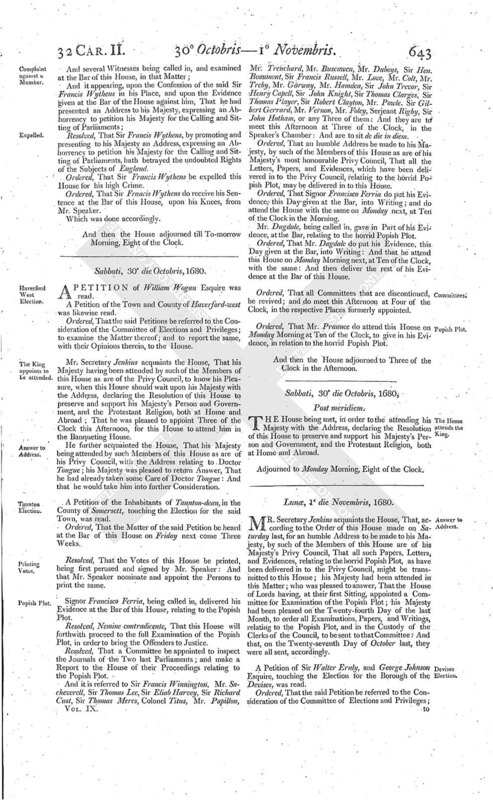 Resolved, That Sir Francis Wythens, by promoting and presenting to his Majesty an Address, expressing an Abhorrency to petition his Majesty for the Calling and Sitting of Parliaments, hath betrayed the undoubted Rights of the Subjects of England. Ordered, That Sir Francis Wythens be expelled this House for his high Crime. Ordered, That Sir Francis Wythens do receive his Sentence at the Bar of this House, upon his Knees, from Mr. Speaker.